Bell was part of the Bears side humbled by Northants at Edgbaston a little over a fortnight ago, and he will be reminding his players of that performance ahead of the re-match. Bears managed to score just 86 for eight in their 16 overs with a rampant Richard Gleeson claiming three for 12 in his four overs, and the Steelbacks then coasted to an eight-wicket success. It was a dominant performance from David Ripley’s men, but they haven’t won since. The Steelbacks’ match against Derbyshire at Chesterfield was abandoned without a ball being bowled due to a saturated outfield, and they have also lost to Notts Outlaws and Durham Jets. The County are still second in the North section though and well placed for a quarter-final spot, but the third-placed Bears will leapfrog them if they can pull off a win at Wantage Road. Birmingham returned to winning ways after a run of three defeats with a 28-run victory over Leicestershire Foxes on Sunday, and travel to Northampton in confident mood, believing they only need one more win to secure a last-eight spot. Asked about how he will approach Tuesday night’s game, Bell said: “I’ll be saying to the guys remember what happened at our place. “Northampton are one of the best teams in the group and we didn’t do ourselves justice against them. “We were way off par, so it would be great to go there and level the score and get ourselves into the quarter-finals. “The win over Leicestershire Foxes was very important for us, momentum-wise. “The guys had a really good day but we have to back it up and beat Northamptonshire. “We need one more win from three games, but the frustrating thing is we should have put qualification to bed already. “We have had opportunities to be top of the group. We have a very good side here - we just haven’t nailed it consistently yet which is frustrating but at the same time quite exciting. “At home to Northampton we had a bad day and got outplayed, but at Yorkshire we lost five wickets for six runs and then at Worcester Matt Wade played one of the best knocks I’ve ever seen and then we lose eight for 19. 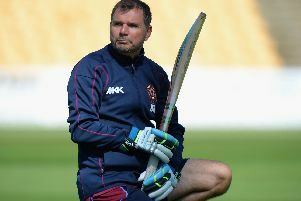 The Steelbacks will be without Ben Duckett for Tuesday’s game, which is being shown live on Sky Sports, as the left-handed batsman is on England Lions duty.